Athletics is an excellent way of staying fit and healthy. However, injuries often go hand-in-hand with sports participation. Even if you manage to avoid acute injury, chronic issues can crop up over time. Every athlete – no matter how skilled – can benefit from professional guidance and advice. Simply put, being active is healthy! Injuries can be avoided and prevented. In fact, it’s estimated that over 16,000 people suffer sports injuries in Singapore each year. These injuries can cause acute pain as well as lead to chronic problems that degrade your quality of life. Whatever your sport and level of play, no participant is immune from the hazards of sports injuries. Running is the easiest type of exercise to adopt. Although it strengthens your heart and burns calories efficiently, running puts a unique set of stresses and strains on your body much greater than those from walking. Hence, it is also the exercise with the most number of injuries. With running becoming increasingly popular in Singapore, we have seen a rise in the number of clients with running related injuries. I’m not a golfer or a runner. Can PhysioActive help me improve my sports performance? Yes! We work with all athletes to get you in optimal condition, no matter your sport. I had an injury years ago. Is it too late to seek help? No. At PhysioActive, we offer effective rehabilitation for both recent and old injuries. I’ve had surgery for a sports injury but am still not back to peak condition. Can you help? Absolutely. In fact, we specialise in post-surgical rehabilitation as well as sports injury rehabilitation. Do you have non-invasive therapies available? Yes. The majority of our therapy modalities are completely non-invasive. I only play sports casually. Is sports physiotherapy still relevant for me? Yes. We can help all levels of athletes – from casual to professional. 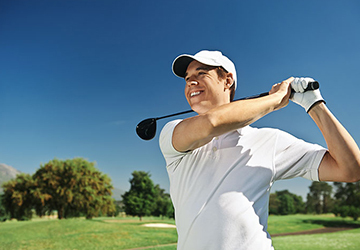 PhysioActive has many sports specialists that are dedicated to shortening your recovery time and allowing you to reach new peaks of performance.Make an appointment today and see how we can help you win at your game.